Trenchless Technology, Pipe Bursting, Wimpy's No Dig Pipe Replacement. Home / Lakewood Ranch Plumber / Trenchless Technology, Pipe Bursting, Wimpy’s No Dig Pipe Replacement. Trenchless Technology, Pipe Bursting, Wimpy’s No Dig Pipe Replacement. You may of lived in the same house in Sarasota for over 35 years. Life is going along just great and over the course of those 35 years you may of had minor plumbing, electric and air conditioner issues. It happens. Everything needs some attention as time passes. Maybe, yesterday your toilet backed up. As you think back over time, you know this has never backed up into your bathtub, like it is now when you flush your toilet. This is a sign that your plumbing system needs attention. Call the Plumber! So you call the Plumber and he clears your line. He may of even ran a camera in in to see why your plumbing system stopped up. Wouldn’t you like to know why this happened after 35 years of trouble free flushing? Maybe to make sure this stoppage doesn’t occur again, the line could be hydro-jetted to clean the pipes. Maybe the Plumber saw in the camera while viewing you waste lines that you had root infiltration. If the Plumber recommends replacing your waste lines and you have really nice terrazzo floors or just had wood, tile or marble floors put down, the last thing you want to do is tear them up. But you need new pipes. Wimpy’s Dependable Plumbing, Sarasota’s Pipe Bursting Expert, can replace your waste lines without disturbing your floors. This amazing technology allows for minimal disturbance. So that instead of old root infested or broken waste lines, you can have brand new waste pipes, so that you can have many more trouble free years of flushing. There is no substitute for new pipes. If you need a Sarasota Plumbing Expert who specializes in old pipe replacement, look no further. 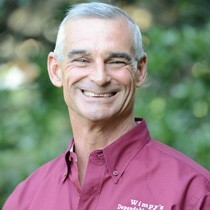 Wimpy’s is a Plumbing company that has been building relationships in Sarasota since 1973. Call today 941-322-1911 or schedule on line, www.loveyourplumber.com.